With our predictive analytics platform, Mortech Protection, we help you not only retain current customers but also grow a portfolio of new customers both inside and outside of the mortgage space. We break these customers into three different categories based on their current status with you as a loan officer. To start you have your current customers that use you as both their primary bank and for their mortgage needs. These are the customers that you have to continuously be pushing your name in front of because they might think that you are no longer there to help with future mortgages after your first initial one is complete. The main goal with this group of customers is to keep your most profitable customers that you already know for life. Mortech Protection will help identify when these customers are shopping for a new home and need new financing. You then can take this data and market to that precise group of people. Another group of customers that you can actively target are those that know and trust your brand as a bank but have their mortgage with someone else. You have to market a tad harder to these customers, as they might have their own trusted company that they use for their mortgage needs and they aren’t interested in actively looking elsewhere. You can use your bank relationship though, in your favor and use brand recognition to persuade them to do all of their finances in one location. You will need to market to these individuals showcasing the time savings advantages to having all of their trusted financial solutions within one location. Why not become a customers’ everything? You have helped them with their past mortgages and plan to help with any future home loans, why not become their primary bank as well? Use your brand trust and open doors for new lines of business. Becoming their everything helps you reach the point of being able to recapture their business in future years. As a customer’s primary bank you also are always at top of mind since they use you on a day to day basis as their source of spending. 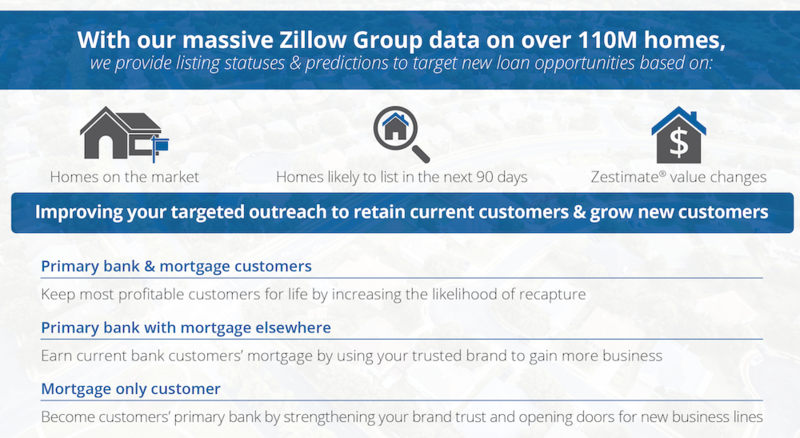 With our massive Zillow Group data on over 110M homes, we can provide listing statuses and predictions to all of the customer scenarios above that currently have homes on the market, will list their home in 90 days, or use Zestimate to target new loan opportunities based on home value changes. Contact Mortech Sales to learn how you can take advantage of our predictive analytics solution, Mortech Protection.